We’d love your help. Let us know what’s wrong with this preview of Tears of the Giraffe by Alexander McCall Smith. This is a previously-published cover of ISBN 9781400031351. Fans around the world adore the best-selling No. 1 Ladies’ Detective Agency series and its proprietor, Precious Ramotswe, Botswana’s premier lady detective. In this charming series, Mma Ramotswe—with help from her loyal associate, Grace Makutsi—navigates her cases and her This is a previously-published cover of ISBN 9781400031351. To ask other readers questions about Tears of the Giraffe, please sign up. Fracesca Dignan I think you can also use good reads to read books , but these books should be quite easy to find . I have never really have any interest in reading the books by this author, but recently a member friend suggested I would probably like them so I decided to give the first one a try. Actually I chose the second in the series by mistake. In the end it didn't really make any difference. The book is fairly short and an easy read. The cover is colourful and striking. The style of writing is quite unique. It is simple and straightforward with a gentle feel, almost old fashioned in a way and somehow it I have never really have any interest in reading the books by this author, but recently a member friend suggested I would probably like them so I decided to give the first one a try. Actually I chose the second in the series by mistake. In the end it didn't really make any difference. I don't seek out Alexander McCall Smith's No. 1 Ladies' Detective Agency books, and yet when I run across them in a clearance rack I can't help but pick them up. Tears Of The Giraffe is the second in the series, and it is just as charming, just as gently comic, as the first installment. My only problem with the book -- and it's little more than a nagging feeling in the back of my head -- is that the author's depiction of his protagonist, the exceedingly down-to-earth, compassionate and somewhat I don't seek out Alexander McCall Smith's No. 1 Ladies' Detective Agency books, and yet when I run across them in a clearance rack I can't help but pick them up. Tears Of The Giraffe is the second in the series, and it is just as charming, just as gently comic, as the first installment. I have a lot to say about Alexander McCall Smith’s series. It is for readers who don’t mind jumping outside a structure and especially; for appreciators of the rich, intricate privilege of immersion in someone else’s culture. Acquaintance with Botswana, Africa is the point. Mysteries are on the side but this series certainly belongs to the genre, in the Botswana way. An incongruous person and place make Precious Ramotswe’s career whimsical; except that it works! Her ‘No. 1 Ladies' Detective Agen I have a lot to say about Alexander McCall Smith’s series. It is for readers who don’t mind jumping outside a structure and especially; for appreciators of the rich, intricate privilege of immersion in someone else’s culture. Acquaintance with Botswana, Africa is the point. Mysteries are on the side but this series certainly belongs to the genre, in the Botswana way. An incongruous person and place make Precious Ramotswe’s career whimsical; except that it works! Her ‘No. 1 Ladies' Detective Agency’ receives ample clients. Rather than one mystery driving the novels; she solves two or three per story, while we observe life in her customs and climate. Do not minimize these by mistaking the underlying whimsy for “cozy mysteries”. The cultural portrayals are profound and the topics are very serious and sobering. These are “standard adult mysteries”, with a perceptive heroine who surprises us at every turn and makes them spectacular. This is a novel to envision, when we say some of them feel like a journey. Uncannily, this Scottish author has no accent and writes halting, plain dialogue; just the way educated people whose second language is English would speak. We learn how to address men and women, how to respectfully shake hands, and to upturn both of them to receive a gift. Not hiring domestic help if you can afford it at all is considered unkind, for it employs the would-be poor. I feel well-versed in interacting appropriately, if I could visit. I absolutely adored the first in Smith’s Botswanan stories, so after a while I set about tackling the sequel. I wasn’t disappointed. TEARS OF THE GIRAFFE is the better book purely because Smith doesn’t have to carefully set up the situation and characters; we already know all about them, so he can just get on with it. The best thing about this novel is all of the different ingredients thrown into the mix. We have another missing child, with a much more complex story this time around; we have a h I absolutely adored the first in Smith’s Botswanan stories, so after a while I set about tackling the sequel. I wasn’t disappointed. The best thing about this novel is all of the different ingredients thrown into the mix. We have another missing child, with a much more complex story this time around; we have a heart-breaking story of a couple of orphans, and we have further character development on the part of Precious’ love interest, Mr Matekoni, as well as her secretary. Thanks to Goodreads friend Laura being persistent about getting me to try this series again, I FINALLY read this book. I’d read the first book in the series many years ago and liked it, but didn’t like it enough to read on. I think I’d even tried this one and put it down. I’d really struggled with this author’s writing style. I was encouraged to read the audio edition with Lisette Lacat as narrator, and I’m so glad. I’m also glad that I decided to keep a copy of the paperback edition because it Thanks to Goodreads friend Laura being persistent about getting me to try this series again, I FINALLY read this book. I’d read the first book in the series many years ago and liked it, but didn’t like it enough to read on. I think I’d even tried this one and put it down. I’d really struggled with this author’s writing style. How very weird at times though. One audiobook part ended when there were just five pages left to a chapter in the paperback. It took me a while but I learned that it was better for me to measure my reading progress using the paperback chapters and to simply stop the audio play when I was at a good point in the paperback. I could get spoiled with the pairing of paper/audio editions. Reading this way would definitely help me read when I have difficulty concentrating, especially when due to neighbors’ noise, but also for when there are other reasons. For this book the audio helped me tremendously with pronunciations and dialect! And I could see the humor via the audio that I missed when I tried to read the paper book by itself. Also, the paper book helped me concentrate on the audio, though I did have to rewind at times, rarely though. Reading the audio and the paper editions at the same time was a real pleasure and like magic for me. And this narrator couldn't be better. She is perfect. I plan to all this series’ books but I will definitely read the audiobooks, preferably with the paper editions too. I can’t afford to buy books but I’ll be looking for a CD player. I can borrow CDs and paper books from the library. I think there might be some audio files too but not many, and right now I have no devices that would work with them. I ended up liking many things about this story. I thoroughly enjoyed the humor. It’s subtle but very amusing and most of it was based on observations of human behavior. Brilliantly done! I loved so many of the characters and the relationships. They were a delight. I appreciated how the various issues and sub-plots were resolved. Very satisfying! I was so engrossed in what was going on that at some point I’d forgotten to be curious about the book’s title. The reader doesn’t learn the meaning of the title until the last two pages of the novel. I liked it! I recently saw the 2016 movie A United Kingdom, twice!, because I loved it so much, and it was fortuitous to then start reading this book. They’re a wonderful pairing. My third read. And it still holds up well. Love this series! This is a wonderful series to read and to reread. This may be my favorite of them all, or at least in the top three. It's the feeling I get when I read or listen to these books that I love to return to: a feeling of satisfaction, as though all is right with the world (even when all is not right in the present moment). In this series, though, good triumphs over evil, and you pretty much know that going in. My third read. And it still holds up well. Love this series! It's the feeling I get when I read or listen to these books that I love to return to: a feeling of satisfaction, as though all is right with the world (even when all is not right in the present moment). In this series, though, good triumphs over evil, and you pretty much know that going in. And then, at the end, it's the way I feel at the end of a beautiful symphony. Everything comes back to tone. And that's just the way I feel every time I close one of these books. This series has become a place I turn to when I want to feel like everything is right with the world again. It's reliably wonderful. I read "The No. 1 Ladies' Detective Agency" several years ago. I remember it being fun and fresh and quirky, but it didn't grab me and I wasn't desperate to carry on with the series. 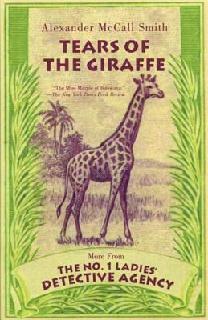 Having now read "Tears of the Giraffe", I am eager to find out what happens next. This is, simply put, an exceptionally good book. Every person in the western, "civilised" world should read it and be humbled. This time around, Alexander McCall Smith delivers a simple and heart-warming story, which is concerned far mo I read "The No. 1 Ladies' Detective Agency" several years ago. I remember it being fun and fresh and quirky, but it didn't grab me and I wasn't desperate to carry on with the series. Having now read "Tears of the Giraffe", I am eager to find out what happens next. This is, simply put, an exceptionally good book. Every person in the western, "civilised" world should read it and be humbled. This time around, Alexander McCall Smith delivers a simple and heart-warming story, which is concerned far more with the characters and community than with the little mysteries therein. I'll admit that I was counting the pages and wondering when he would get back to the cases (what little there is of them), but not at all because I was bored - if anything, I wanted the novel to be a hundred pages longer. Nevertheless, this tiny book packs a punch - and I, for one, could almost imagine jumping on the next available plane and visiting Botswana, just to experience the people and the environment for myself. The writing style is deceptively simple, but it's easy to read between the lines. The author manages to find a balance where he can introduce you to a different way of life without causing you to feel like an outsider. The setting is both worlds-apart and surprisingly familiar, and the characters come right off the page. There are also some cute moments where things are lost in translation; a little discussion about Dr Freud springs to mind and after all, why shouldn't a little boy love his mother? What stands out the most, and in stark contrast to the majority of western crime and mystery writing, is the all-encompassing sense of hope that Mma Ramotswe brings to the fore. Far from a jaded, cynical, troubled protagonist - this is a large woman with a large heart, who somehow always manages to come across as brave and insightful, where a weaker character might have been painfully naive. She bounds into all sorts of adventure and mischief, taking it all in her stride and never letting the badness rub off on her or wear her down. A delightfully gentle series of books by Alexander McCall Smith - set in and around Botswana's capital city of Gaborone and stories of the 'No.1 Ladies Detective Agency'. McCall Smith has created a lovely world of mainly (very) amateurish sleuthing - which whilst ostensibly the theme which is central to these books, is ultimately almost incidental. The main draw here is the cast of well drawn, well written, very memorable and on the whole very endearing (if occasionally frustrating) characters - A delightfully gentle series of books by Alexander McCall Smith - set in and around Botswana's capital city of Gaborone and stories of the 'No.1 Ladies Detective Agency'. McCall Smith has created a lovely world of mainly (very) amateurish sleuthing - which whilst ostensibly the theme which is central to these books, is ultimately almost incidental. The main draw here is the cast of well drawn, well written, very memorable and on the whole very endearing (if occasionally frustrating) characters - Precious Ramostwe, Grace Makutsi, J.L.B. Matekoni et al and the interplay of their lives - the detective work and cases here become increasingly an incidental backdrop. The 'No.1 Ladies Detective Agency' stories and characters certainly have an air of authenticity and believability (although obviously contrived and significantly exaggerated for comic effect) and interestingly McCall Smith did spend some time living and working in Botswana. The first few books in the series are undoubtedly the strongest, funniest, most entertaining and compelling. Whilst later installments are all good - they do feel like somewhat of retread of ideas that McCall has spun out perhaps beyond their natural course. Whilst serious themes are alluded to - feminism, AIDS and domestic violence; there is little here that is particularly thought provoking or challenging - but then that's not the point here. For anyone wanting a series of light, likeable, entertaining, funny, absorbing, well written and compelling amateur detective books - with a difference, then the 'No.1 Ladies Detective Agency' books are a must. Good stories, simple truths - people doing the right thing. Ultimately these stories are all about kindness, forgiveness, restitution and resolution. Which in itself is surely a good enough reason to read at least some of this lovely series of books? McCall paints a serene picture (although with a bit of mystery and detective work going on) of Botswana and a wonderful cast of characters. I've been wanting to read this second book in the series for a while now and I'm so glad I finally got to it. I don't think I'll wait as long to get to the next in the series. I felt that Mma Ramotswe, as a character, is put on the back-burner for this book, and more attention is paid to other character who may or may not warrent it. There's more about JLB Matekoni, Precious' fiance, and two orphans who join the family - warrented; but there's a lot of backstory for Matekoni's maid, whose plan to frame Ramotswe is built up heavily and then deflated before it really jumps. The cases were not as interesting to me in this book - the formula has already been established and there wasn't anything special that was done - Ramotswe, level-headed and fair, uses her intuition and detective-book learning to smooth out misunderstandings/mysteries. There were a few times that I wanted to see her get fired up about something - really bring home the thunder on someone, but although she had plenty of opportunities, she doesn't rise to take anyone's bait. The main mystery in this book was the case of a missing American man/boy whose mother has returned to Africa to try and get closure. Well, the boy wasn't murdered, so no one is really to blame, and the South African tart that is the mother of his son (although she was also screwing around with the "evil" guy who "kind of" caused his death) (oh, and yes, McCall-Smith's agenda of disliking South Africa/Africans is quite evident here, in case you didn't pick up on it in the first book), is forgiven by the mother who enjoys an afternoon of catching up with her and the grandchild. So.... if you understood anything in that last sentence, pat yourself on the back. This review has been hidden because it contains spoilers. To view it, click here. 2nd book in the No. 1 Ladies' Detective Agency series. I was trudging my way through Twilight (still only half done with that book after two weeks--a shame) when I decided to shift my focus to this instead. I breezed through this book. The story picks up right where the last one left off and is just as personable and easy to read. Along with a fiance, Precious has picked up an adopted son and daughter. Some may think she went along with that too readily, but it seemed in character for her to me. 2nd book in the No. 1 Ladies' Detective Agency series. I was trudging my way through Twilight (still only half done with that book after two weeks--a shame) when I decided to shift my focus to this instead. I breezed through this book. The story picks up right where the last one left off and is just as personable and easy to read. Along with a fiance, Precious has picked up an adopted son and daughter. Some may think she went along with that too readily, but it seemed in character for her to me. Firstly, she'd lost her own child and is unable to have anymore, and it's obvious that she wants children. Secondly, from the way she talks about how traditional and familial that the people of Africa are (or used to be as she thinks this younger generation is going down), would it have been in character for her to cause a stink because of the children? I love how much pride the characters have in their country and how life is just a different experience for them. I didn't enjoy this one as much as I did the first for a couple of reasons. I thought the angle with the maid fizzled before it even got started. There's a bit too much of Mma Ramotswe KNOWING things without any explanation why she might know these things aside from intuition, which can be very strong but not plausible in every hunch. Parts of the book were rambly, and I think this was to give the book a more personable tone. However, it really just makes you want to skip right over it and get to the point at times. I realize this is only the second book in the series, but for whatever reason I read the first one some years ago and then skipped ahead to five and then to seven or eight or so, and am now making an effort to catch up. But not too fast! The thing about a series you really like is not, IMHO, racing through them all but letting them sit there like money in the bank, waiting for you to savor. This volume is the one where Mr. J.L.B. Matekoni finds himself adopting two children---without first check I realize this is only the second book in the series, but for whatever reason I read the first one some years ago and then skipped ahead to five and then to seven or eight or so, and am now making an effort to catch up. This volume is the one where Mr. J.L.B. Matekoni finds himself adopting two children---without first checking with Precious, his fiancée. Being the lovely lady she is, she of course goes along and moves the children into her own home. She also promotes Grace Makutsi, her secretary, to assistant detective. Grace solves a mystery, but is then caught in a moral dilemma about what to do with her findings. Meanwhile, Precious is tracking down what happened to a young American man who disappeared there in Botswana many years ago. I read the first book of The No.1 Ladies… series a long time ago and I don’t remember much about the plot, but I do remember I quite liked it. What appealed most to me was solving mysteries in the Botswana setting, how “simple” were the mysteries and reading about how they live there. Being used to read fast paced thriller or vast conspiracies, it was nice to read something “lighter” but enjoyable in its simplicity. The second book follows the same pattern: a couple of easily-solved mysteries an I read the first book of The No.1 Ladies… series a long time ago and I don’t remember much about the plot, but I do remember I quite liked it. What appealed most to me was solving mysteries in the Botswana setting, how “simple” were the mysteries and reading about how they live there. Being used to read fast paced thriller or vast conspiracies, it was nice to read something “lighter” but enjoyable in its simplicity. The second book follows the same pattern: a couple of easily-solved mysteries and new developments in Mma. Ramotswe life following the events that happened at the end of the first book. It always a delight to read this books (as it also was to watch the tv show, be sure to check it out) although I find them a bit short. Luckily, there’s fifteen of them. This makes for a good light read that everyone can enjoy and it’s always interesting to learn new things about Botswana. Another charming tale of Mma Ramotzwe. Many moral dilemmas woven through the tale, for which eventually the good prevails. Great read! E' molto carino, breve e scorrevole ma non superficiale, apparentemente ingenuo ma pieno di "saggezza". Mentre si legge sembra di stare sotto un'acacia, si vedono i colori del Botswana, le strade polverose, i bambini sorridenti. E' la stessa meravigliosa parte d'Africa descritta nei "Racconti Africani" di Doris Lessing, ma qui c'è un tocco di - consapevole - leggerezza. E il "giallo" è solo un pretesto per riflettere sulle vicende umane. What a lovely, refreshing story. This is a continuation of the No. 1 Ladies' Detective Agency. Now Precious is engaged to a mechanic who owns his own garage. She has now promoted her secretary to assistant detective and she is doing some great work on her own. There are also some new additions to the family that are sweet and charming. As usual, a wonderful read with many human, heartwarming stories. Tears of the Giraffe by Alexander McCall Smith was a short, delightful read. The characters are complex, well developed and interesting. I especially enjoyed the strong, independent female character. Descriptions about Africa were fascinating. Several references to the giraffe were thought provoking. The giraffe gives its tears to the women and they weave them into the basket. We can all give something and the giraffe has only its tears to give. "Is Tears of the Giraffe by Alexander McCall Smith was a short, delightful read. The characters are complex, well developed and interesting. I especially enjoyed the strong, independent female character. Descriptions about Africa were fascinating. Several references to the giraffe were thought provoking. The giraffe gives its tears to the women and they weave them into the basket. We can all give something and the giraffe has only its tears to give. "Is it right to do the wrong thing to get the right result?" There weren't as many mysteries as the first and those that were there were not as interesting. The characters remained charming and interesting, though, so overall this was a pleasant read. After I read the first book in the series, The No. 1 Ladies’ Detective Agency more than 5 years ago, I have been kind of collecting this series on my visit to the annual book fairs. I really liked the first one (read my review here). Even though the genre mentioned is mystery, this series is not one of those tipsy-turvy thrillers that would have you on the edge of your seat. It's more like one which you cozily enjoy with a cup of tea. No wonder this genre has found its name as a tea cozy myster After I read the first book in the series, The No. 1 Ladies’ Detective Agency more than 5 years ago, I have been kind of collecting this series on my visit to the annual book fairs. I really liked the first one (read my review here). Even though the genre mentioned is mystery, this series is not one of those tipsy-turvy thrillers that would have you on the edge of your seat. It's more like one which you cozily enjoy with a cup of tea. No wonder this genre has found its name as a tea cozy mystery. It aptly fits the book of this series. Having known the characters in the first book, this one settles you down with more happening in the personal life of Mma Ramotswe rather than a whole lot of cases to solve. But that is good because we need some action to happen in the life of our favorite detective when so much is happening on the outside. Anyhow, the book is heavy on Mma Ramotswe with a lot happening in her life but as always she manages to work out everything. The book is a tad bit sad with not all coming to a happy end but well that's how life goes, right? Went back to this popular detective series and really saw a huge improvement in both the story and the cases being solved - actually the cases were pretty obvious but interesting never the less. We got a lot of character development with Mma Ramotswe and her supporting cast including two little ones who have found their way into her life and the story. Maybe it was because I read this out loud to my wife and therefore could not just breeze through the book, or maybe it was due to her reactions bu Went back to this popular detective series and really saw a huge improvement in both the story and the cases being solved - actually the cases were pretty obvious but interesting never the less. We got a lot of character development with Mma Ramotswe and her supporting cast including two little ones who have found their way into her life and the story. This story took me deeper into the traditions of Botswana and their many gentle people, and gave some insight into the broader African conflicts - but mostly it was a wonderful story of Mma Ramotswe and her Detective Agency. The result of the cases that Mma Ramotswe takes on very often end up helping others in a very sensible way, and in the midst of her investigations we are also pulled in to her lovely life, where she is engaged to a very kind man who has surprisingly taken in two orphan child This story took me deeper into the traditions of Botswana and their many gentle people, and gave some insight into the broader African conflicts - but mostly it was a wonderful story of Mma Ramotswe and her Detective Agency. The result of the cases that Mma Ramotswe takes on very often end up helping others in a very sensible way, and in the midst of her investigations we are also pulled in to her lovely life, where she is engaged to a very kind man who has surprisingly taken in two orphan children. The cases are interesting, the family life is interesting, and the escapades are fun as well – with a tiny suspicion of possible danger thrown in for some more spice. A very fun fast read. While I thought the book was just OK, it has some interesting topics for discussion. Why do Americans always think their way is the best way? And aren't we right most of the time? How is it that everything works out so well for Precious? I find it too implausible. She is able to track down a lost man after 10 years by using just the right blackmail material that she learned from just the right disgruntled student. Seriously? I found her reaction to the adopted children a bit out of character. Not While I thought the book was just OK, it has some interesting topics for discussion. Why do Americans always think their way is the best way? And aren't we right most of the time? I found her reaction to the adopted children a bit out of character. Not that she wouldn't do the "right" thing, but an independent woman would want more of a say in such a monumental decision, right?